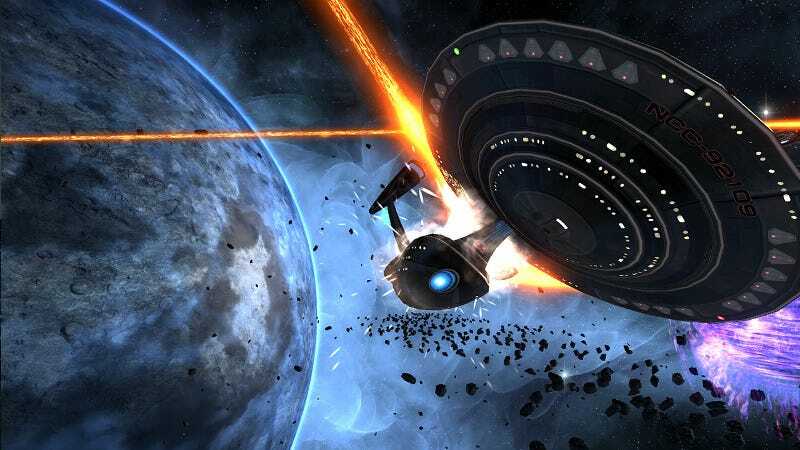 How Does Star Trek Online Fit Into the Star Trek Mythos? The Federation is trying desperately to maintain peace in a chaotic galaxy shattered by war. Violent Klingons and bizarre alien invaders threaten. Sounds like the earliest days of Star Trek, but this is the galaxy's future in Star Trek Online. Star Trek Online begins in the year 2409, 30 years after the events of Star Trek: Nemesis. More importantly, it's just over 20 years since Spock traveled back in time after the destruction of the Romulan homeworld. That event destabilized the galaxy, cascading into a chain of events that puts an emphasis on warfare rather than peaceful exploration. While the game incorporates elements of the J.J. Abrams Star Trek movie as they affect the "prime" Trek timeline, there is no reference to "nu-Kirk" and the other rebooted characters. As soon as Spock went back in time, he created a divergent timeline. The actions of the reboot characters don't affect events in the long-established Trek canon. Still, the Federation is left to deal with the aftermath of Romulus' destruction, which did happen in the prime timeline. That aftermath includes the Klingons reverting to their old aggressive stance, going to war against both the Romulans and the Gorn. To further complicate matters, the Klingons believe the Federation has been infiltrated by the Undine, a race you probably know better as Species 8472. The Undine have developed some kind of shapeshifting technology, and have probably infiltrated the Klingon Empire as well. That gives the whole situation a nice dose of Cold War paranoia. The Klingons aren't the only antagonists, however. The tutorial mission takes you through a sudden, bizarre attack by some malfunctioning Borg. The somewhat hilarious conceit that every player gets to captain his or her own ship straight out of Starfleet Academy is played off as, "It's wartime, kid." Fair enough. It's an intriguing set-up, and directs the Star Trek mythos in a more action-oriented direction (although it begins to feel like the extended Star Wars universe, with the endless cycles of benevolent Republic becoming corrupt Empire being overthrown by plucky Rebels who form a benevolent Republic). Are the events in Star Trek Online official canon? Really, nothing beyond TV episodes and films is "official," and even then there are contradictions that cause some fans to argue against certain episodes counting toward canon. It is best to consider the game "soft canon," like the novels and comic books. I got the sense that the story is moving to where they can almost-but-not-quite seamlessly introduce two paid expansion packs letting you play Romulans and Cardassians and/or Changelings. The Borg are going to be bogeymen to be pulled out for end-game content whenever they have a hole that needs to be plugged. So the status quo of the Trek universe was shifted drastically prior to the game's launch, but don't expect things to change much as long as people are paying their monthly subscription fees. The story is interesting, if a bit open-ended, but is it any fun to play? At times it feels like the culmination of every Trek fans' ultimate dream, to walk around the halls of Earth Spacedock interacting with Federation officials, meeting Sulu's awkwardly named great-grandson, actually being in Starfleet. When you look out the observation deck window and see the limitless gulfs of space, it's pretty cool. When you're warping across the galaxy and receive a hail from the admiral asking you to check out a spacial anomaly in the Paulson Nebula, that's pretty cool. Also cool: the ability to customize your character, including creating your own alien race; customizing your ship's design, including the lighting on your bridge; developing a specialized set of skills within your chosen discipline (science, engineering or tactical). Less cool is the clunky ground combat on away missions, which all seem to devolve into a basic shoot-em-up that feels very un-Trekky. The lack of full three-dimensional space combat is also a drag. Starships maneuver like underpowered airplanes, unable to loop, roll or deviate from the arbitrary flat "plane" of space by more than 45 degrees. Ultimately, grinding through space combats to increase rank got boring very quickly. My Vulcan science officer (T'Rell…and it took a major act of willpower to not name her T'Pain) felt utterly outmatched in combat, both on the ground and in space. Since that seems to be the game's major focus, most missions left me frustrated. If you love Star Trek, or just the idea of captaining your own starship, Star Trek Online is worth a look. At its core, it offers a way to interact with a beloved mythos in a way we've never really had before. Will the thrill of shifting power to the forward shields, firing salvos of photon torpedos at a Bird of Prey and clicking your engineer's "emergency shield power" button while yelling, "I'm givin' 'er all she's got!" make up for the mechanical frustrations? I guess it depends on how much those rank pips on your Starfleet uniform mean to you. Sign up to play on the official Star Trek Online site.